Create sequences with a powerful 16 track sequencer, record live samples from vocals, guitars or other audio inputs and choose from over 2000+ built-in sounds with the versatile Roland FA-08 Music Workstation. Take advantage of Roland&apos;s advanced 88 note piano action with escapement using the latest Ivory feel G keyboard and SuperNatural sound technology. The Roland FA-08 offers the best of Roland sounds and features in a compact workstation which is ideal for stage, home and studio. The FA-08 workstation takes it huge sound source from a range of Roland&apos;s best products and sets it out based around the system of the Integra-7 module. A selection of SuperNatural sound tech from the Integra-7, sound selections from the XV5080 and Fantom series create the massive 2000+ sound library. As the system is based on the Integra The FA-08 is capable of downloading all the sound patches from the Roland Axial site which are compatible and therefore instantly expanding the sound library of the FA-08 instantly. With the help of the large colour LCD, it is possible to get down and dirty into the depths of the sounds themselves for editing and creating custom sounds to suit any taste. Supernatural sounds have their own editing screens to access all the advanced features that are related to the advanced sound source whilst other sounds have the usual in-depth control for editing envelope generators, oscillators, filters, effects and more. One great advancement of the FA-08 over previous Roland products is the way they have made it easy to access the editing features and controls. The screen has made this possible allowing clear readout and access to parameters and adjustments. 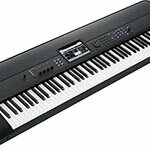 The FA 08 workstation is also 16 part multi-timbral so up to 16 sounds can be triggered at once. As well as being able to rigger all 16 parts the sounds can also be layered/split across the keyboard. With the editing capabilities it is even possible to split sounds into multiple parts then split those sounds with other for a mammoth number potential split sound across the keyboard. The possibilities of such flexibility are pretty much endless. The Roland FA-08 has a built-in 16 track sequencer with non-stop looping capabilities. The new non-stop loop allows users to easily lay out their sounds on each part, set a loop length and then simply switch between tracks without ever turning the record button off. This makes it super fast for creating your riffs and song sections with the full choice of sounds - non-stop. A cool rehearsal function allows testing of the parts sounds and play practice whilst the loop is still running without recording and then it can be switched directly back into normal record to lay down the track. The large colour screen has been used to beautifully show the 16 track sequencer as blocks, very similar to most DAW systems, across the screen where information has been recorded. This makes it intuitive to use and easy to navigate which is essential when trying to compose and create songs. A built-in live sampler with editing which also has a great secret - it streams audio from SDHC cards. The means that the memory capacity for storing samples is limited to the size of the SD card which is purchased by the customer and is therefore not fixed in size by the internal RAM systems of many products. It also means waveforms can be added to SD card and played back using the trigger pads without having to sample in the product. Because the SDHC cards can hold a large amount of data (depending on purchased card) then it is possible to play full tracks with a single push of the trigger pad. The trigger pad is a 16 button grid (with 4 banks to choose from) so when combined with sample streaming the possibilities for triggering back samples, tracks or anything live is huge! As it is direct from SDHC card it also means no loading time just instant selection and playback. The sampler has editing features on board so it is possible to loop, set start/ end points, truncate etc in order to get the sample exactly as required for your performance on the FA 08. 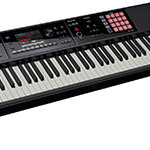 Furthermore the sampler can actually record the live play of the keys or sequencer or even an audio input plugged into the workstations rear input sockets. If using the sequencer then it makes it easily possible to re-sample parts being played and trigger any section then at will just using the pads alone. 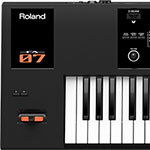 Roland&apos;s FA-08 workstation has one of the most powerful effect systems ever produced on a Roland instrument. Based around the powerful Fantom G, the FA08 can have up to 16 simultaneous effects which makes 1 effect available for every part of the sequencer or studio set. On top of that six COMP+EQ processors for drums, unique TFX (total effects), and global EQ, chorus, and reverb can be used for the ultimate sound enhancement capabilities. The heart of most modern studio set-ups is based around a computer and DAW system. The FA-08 will integrate beautifully with any DAW system. The rear USB connection allows direct computer connection and with just a single cable it is possible to transfer MIDI and Audio data as if you had a controller keyboard and a 2in/2out audio interface. MIDI data is streamed to and from the computer whilst the digital audio is also transferred down the line. With this feature it means digital quality audio can be recorded straight into the DAW system with no need for additional cables and making the full use of the high quality built-in sound source for the FA-08. Connection of headphones or speakers to the output of the FA-08 will then allow the user to hear everything that is playing back from he computer in real-time so there is no need for additional audio interface connections. Whether using to perform live ion stage or record in the studio, the FA-08 has a choice of controllers and performance enhancement features. A choice of 6 knobs has a matrix grid style layout offering 2 rows of preset controls for tweaking sounds live as well as more rows for assigning user controls. These controls can be assigned to a range of parameters making them perfect for liver performance or using to modify elements of your DAW system. All controllers are sent out via MIDI so they can easily be used as controllers for external systems. Roland&apos;s famous D-Beam system is also integrated into the top panel. D-Beam uses an invisible light controlled by the movement of your hand either up or down to adjust the assigned parameter. Aimed at the mid-range price bracket the Roland FA-08 is a powerful/ versatile workstation offering features which are normally focused on higher end products. With features that can be used in the studio as well as for performing live on stage with studio quality sounds it also makes it useful for a liver performer as well as any studio musician.